We often share images of the Market Square in Waltham Abbey on our social media sites and thought we would make a little gallery of some of the photographs we have. Museums at Night – Victorian Extravaganza! As many of you know while Epping Forest District Museum is closed for redevelopment there is the chance to visit our sister site, Lowewood Museum. On Friday 15th May we would like to invite you to visit Lowewood Museum and enjoy our special Museums at Night Event. 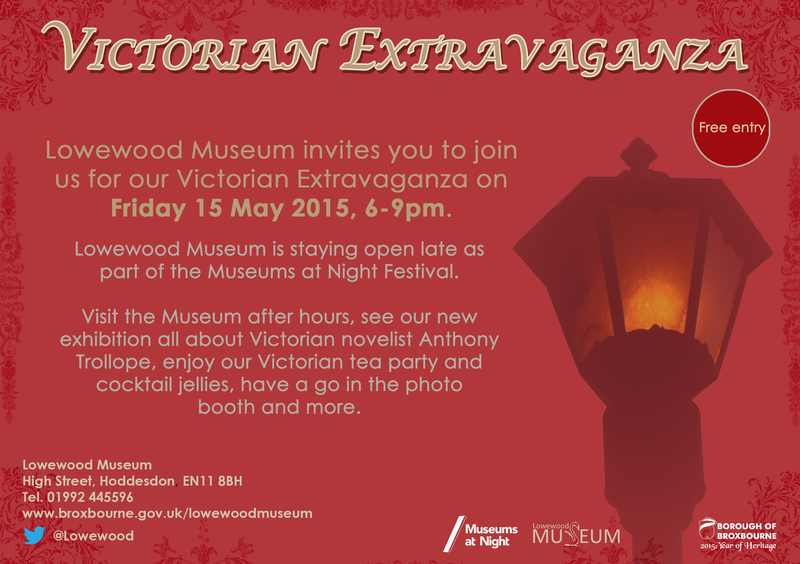 Lowewood Museum will be staying open late for a special Victorian Extravaganza to celebrate Museums at Night, a National initiative, on the 15th May 2015, 6pm – 9pm. We are inviting the community to come and take a fresh look at the museum as part of this one off FREE event. To celebrate 200 years since the birth of beloved Victorian novelist Anthony Trollope, join us for our Victorian Extravaganza as the museum opens its doors from 6pm to 9pm for one evening only. Explore the museum in a new light and join in the wide variety of activities we have on offer. There is the chance to enjoy our tea party with fantastic food and that all important cup of tea as well as some very special cocktail jellies! Have a go at getting dressed up in Victorian costume and get your photo taken in our Victorian photo booth and join in and try out some famous Victorian decent and profane games. If you haven’t heard of the museum or been meaning to visit for a while this is the perfect opportunity.